Oliebollen are normally made with milk, egg and wheat flour, but this recipe uses milk alternatives and no egg. So suitable for vegans. Soak the dried fruit for 5 minutes in lukewarm water and dry thoroughly. Heat the milk to tepid temperature and dissolve the sugar and the yeast. Add cinnamon, lemon juice and a pinch of salt. Put the flour in a large mixing bowl and add the liquid and dried fruit. Mix everything together and leave in a warm place to prove (I normally put a moist, clean tea towel on top). Leave to rise for around 1 hour or more if there is not a warm place. Heat the vegetable oil to 180C. Make little balls using two tablespoons or ice scoop and gently put in the hot oil. Fry for around 2-3 minutes and turn to fry for another 2-3 minutes. They should be evenly browned. Serve with icing sugar on top or with Sukrin for a lower calorie version. 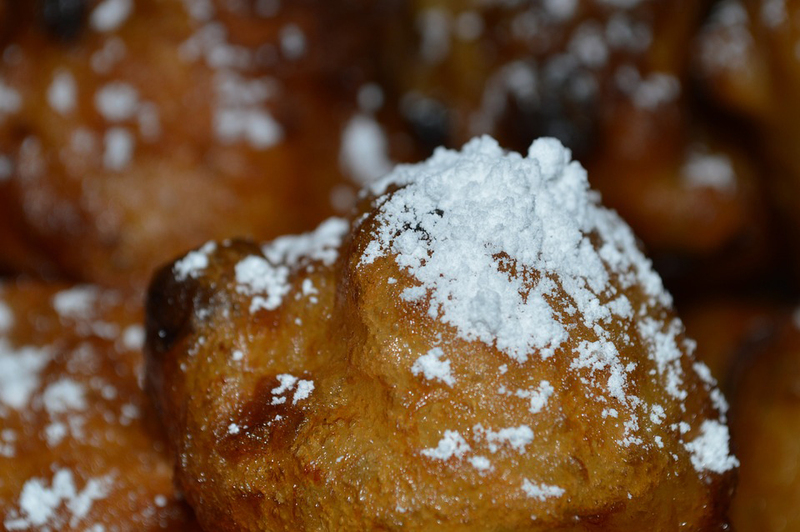 Oliebollen are traditionally eaten in the Netherlands on Hogmanay and New Year’s Day. You can buy them fresh on the streets, where they get fried while you wait. It’s even such a tradition that every year there is a contest to see who can make the best ones!